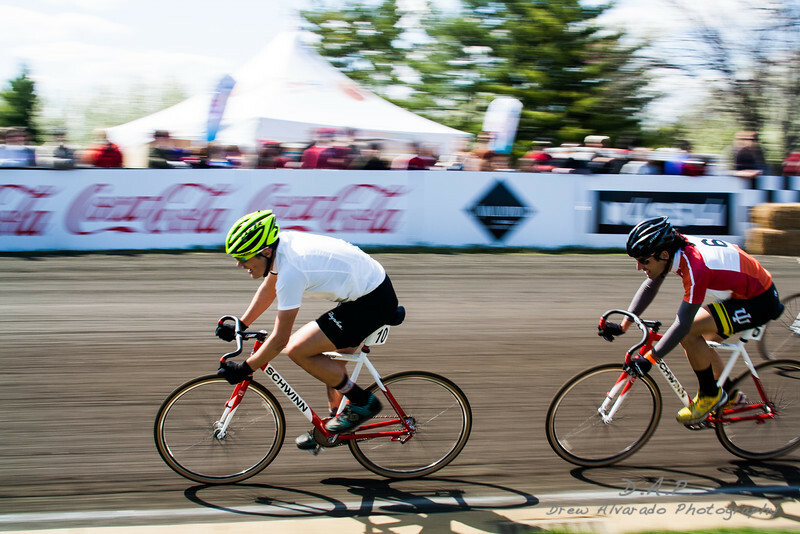 The Indiana University Little 500. 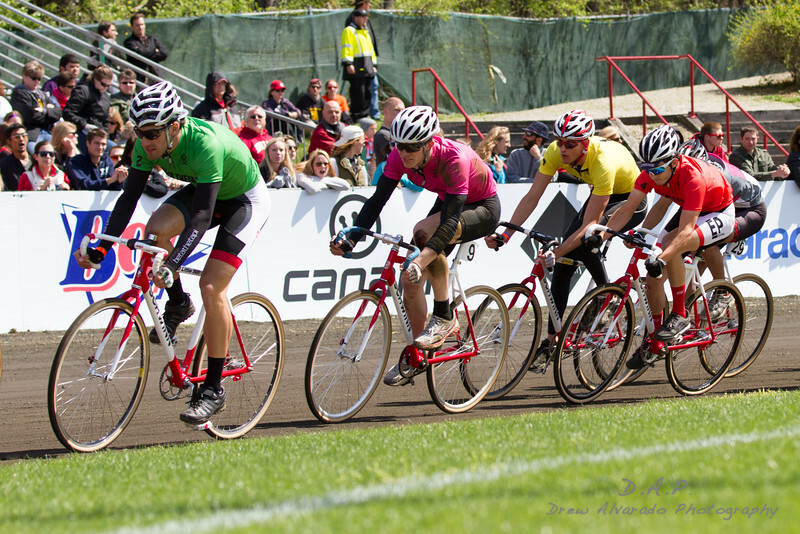 A historical bike race and the inspiration for the 1979 movie “Breaking Away”. 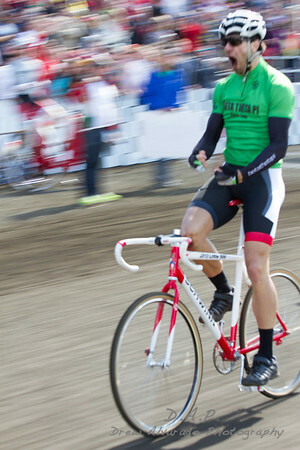 A 200 lap (50 mile) bike race held on the cinder race track in the Bill Armstrong Stadium at Indiana University. Founded in 1951, this is the 63rd running of the race. 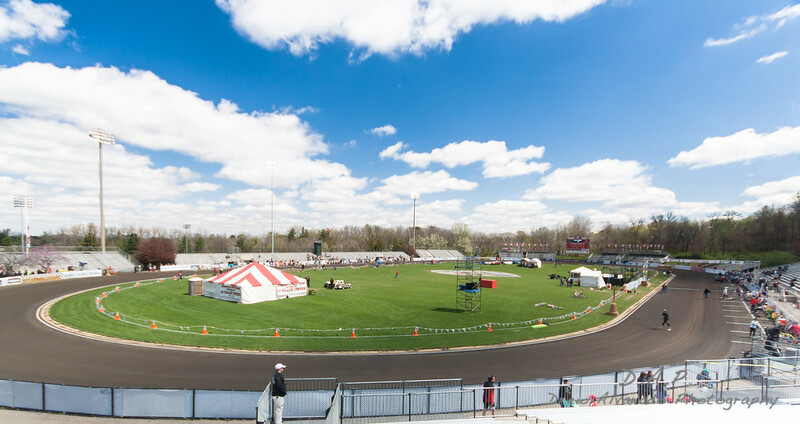 The Little 5 is a relay style race featuring 33 four man teams of IU students. 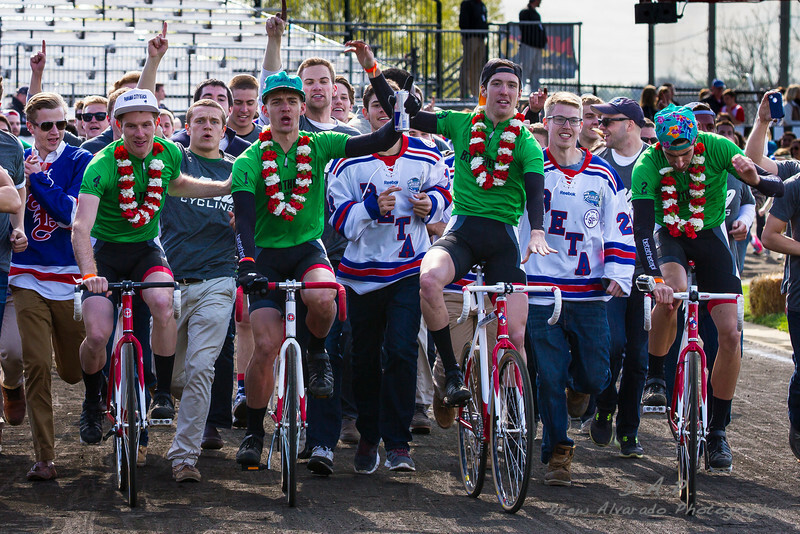 This years race was won by the pole setter team, Beta Theta Pi in a white flag lap sprint to the finish to pass returning champs Delta Tau Delta to take the checkered flag by 0.319 seconds. With 20 laps to go the Black Key Bulls were the first team to make a move and pull out front. Through a series of burnouts and quick rider changes the Betas were able to regain and extend their lead to almost 10 seconds with 10 laps . This quick burst of energy however, came at a cost. The returning champions, Delts used this to their advantage to make a charge and gain the lead. 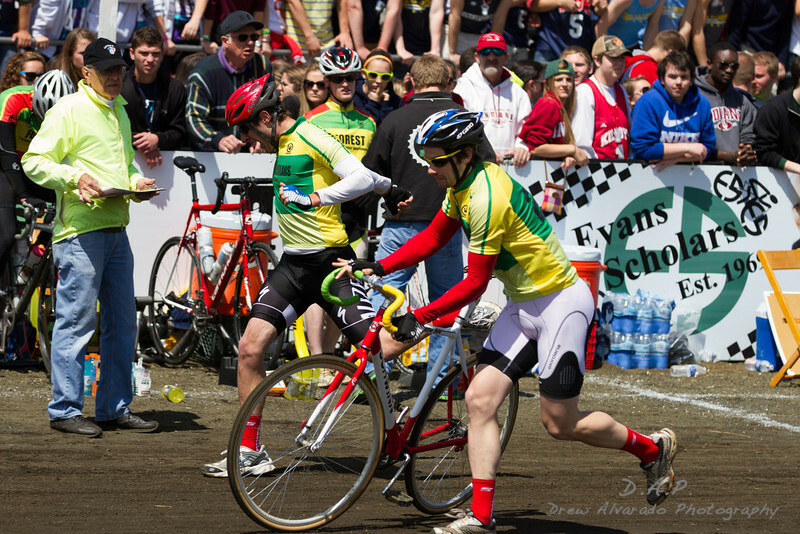 It was the Beta’s plan to have Eric Anderson complete the final laps of the race, however , because of muscle cramping Eric would have to sit this win out and let Will Kraige take the final laps and the win for Team Beta. 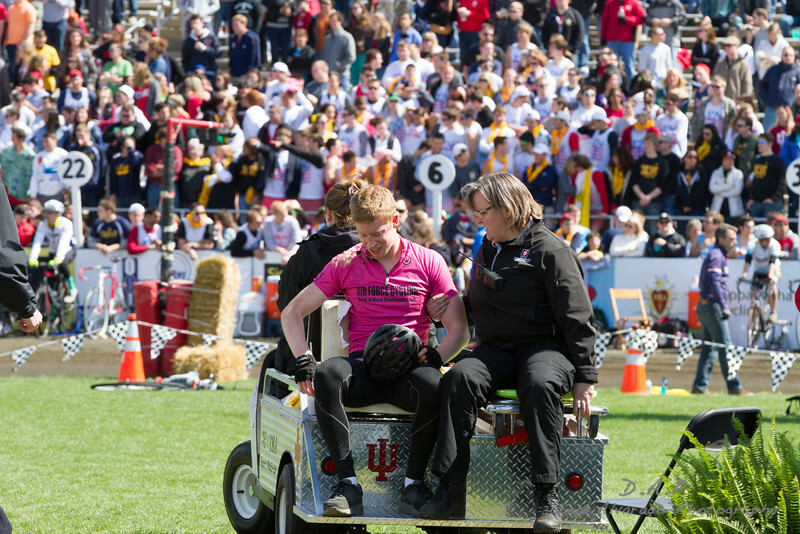 Making his charge down the back straight Will Kragie is able to pass the Delts in the third turn to cross the finish line 0.319 seconds ahead of team Delta Tau Delta. 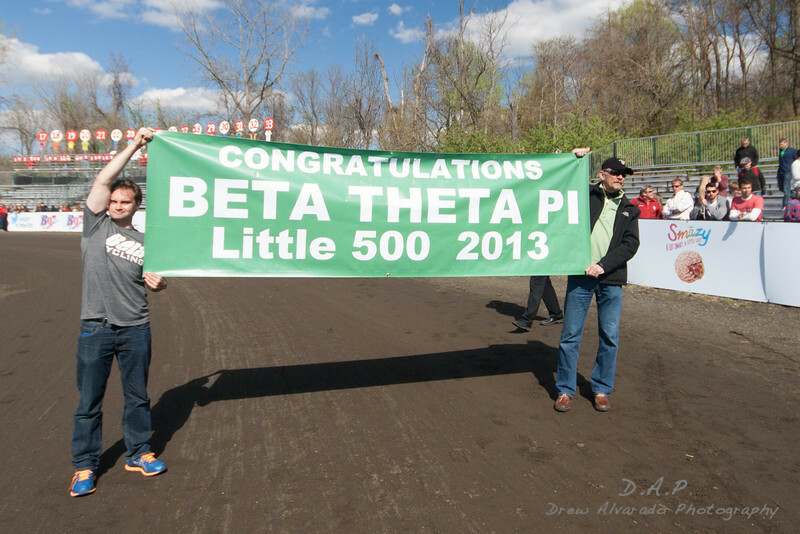 This is the Betas second win in the Little 500, their first win being 49 years ago in 1964. Rounding out the top 5 were Phi Delta Theta (3), Cutters (4), and Black Key Bulls (5). The calm before the storm. 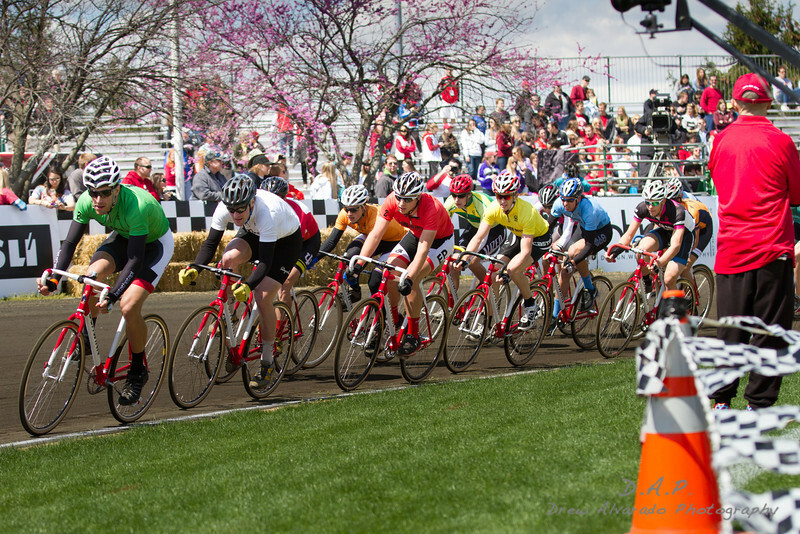 Indiana University Bill Armstrong Memorial Stadium the site of the 63rd annual Little 500 bike race. 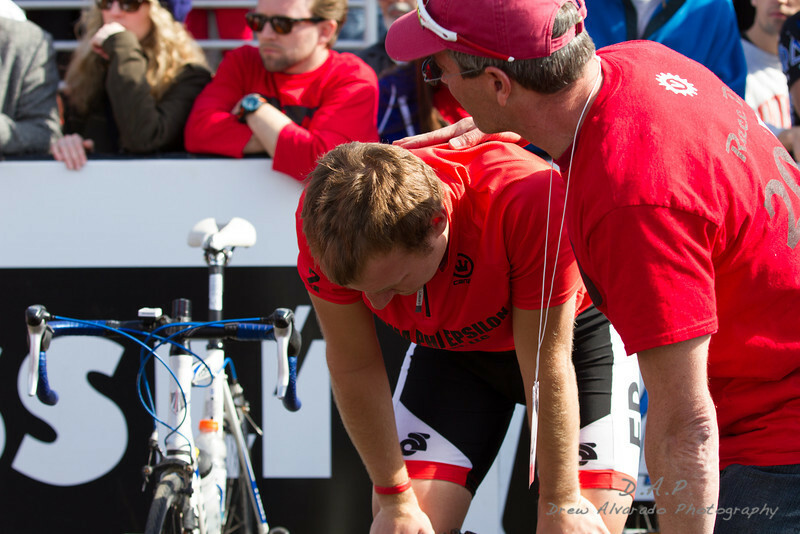 Each team and team member has their own way of gearing up for the race. Here, the pole setters, Beta Theta Pi team relaxes. 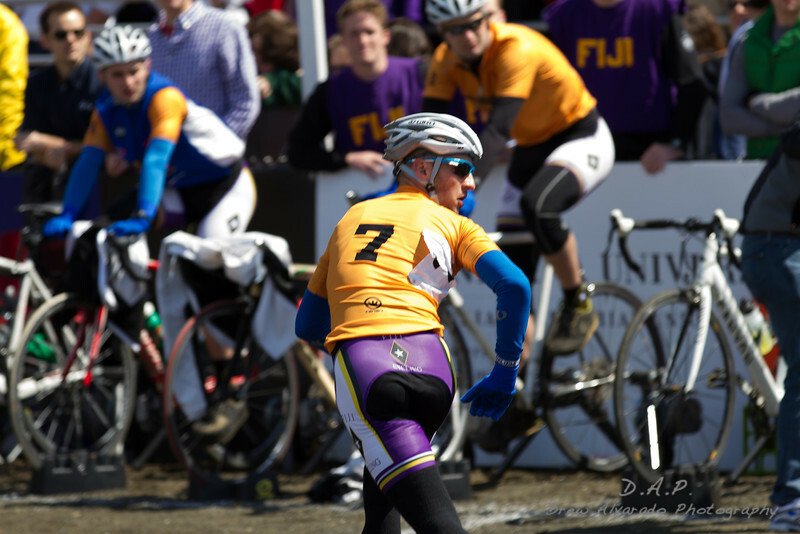 This Sigma Alpha Epsilon rider keeps his muscles warm and ready for battle on a bike trainer. 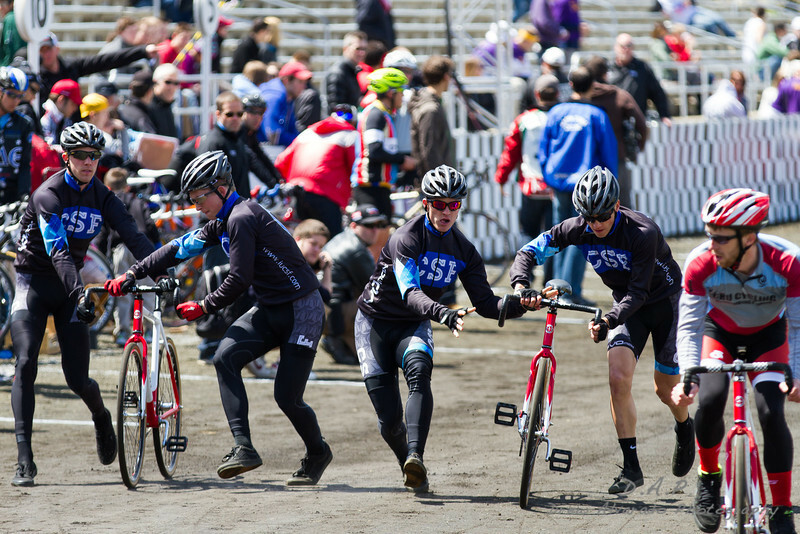 The Cutters team practices their bike exchanges in the pits. The CSF team works on their bike exchanges as well. 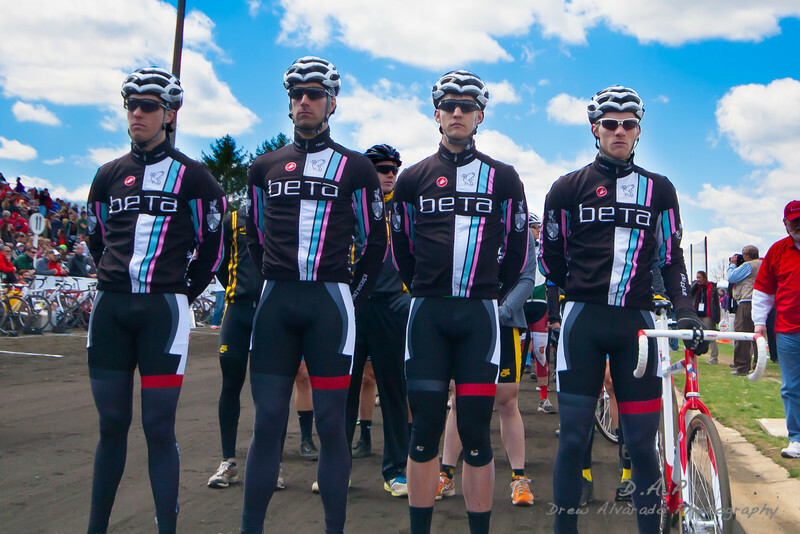 The 2013 Little 500 pole sitters, Beta Theta Pi. 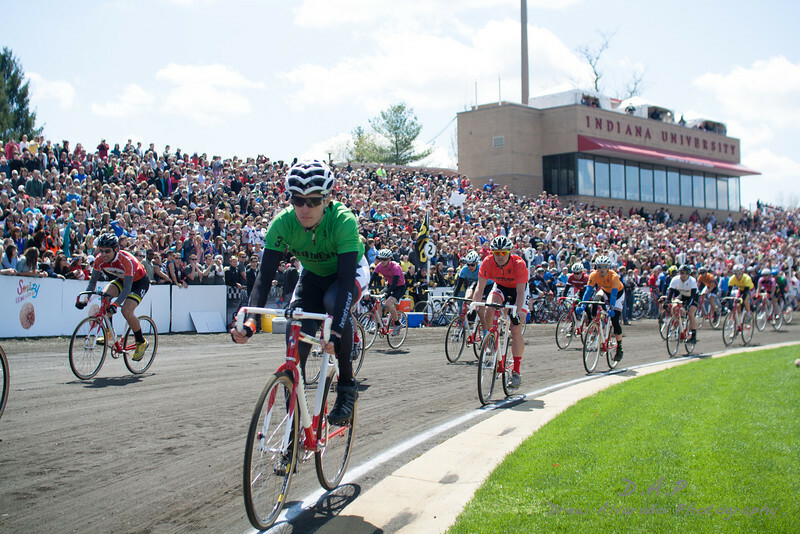 The 33 teams of the 2013 IU Little 500. 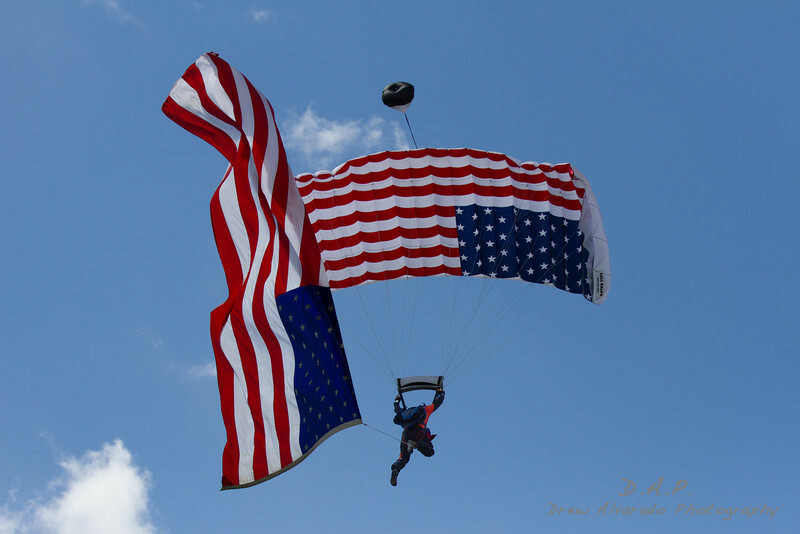 The US flag was brought in style to the infield by the skydivers of Skydive Indiana. 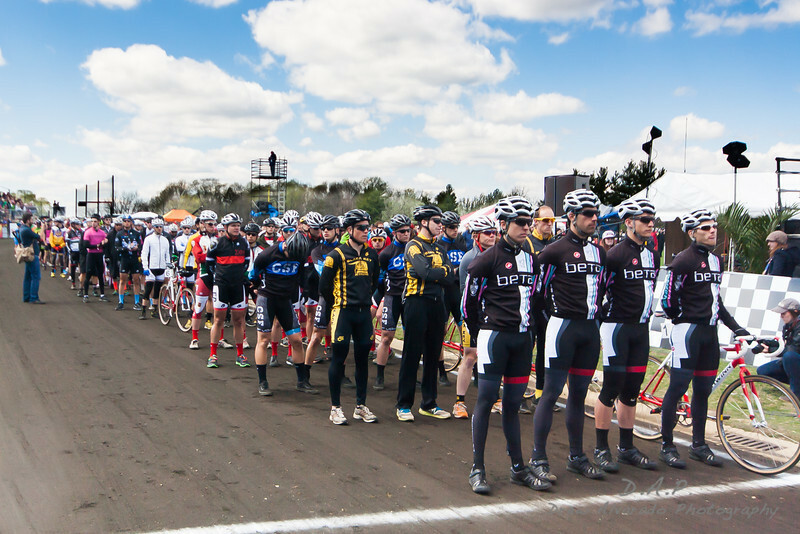 The 33 teams follow the pace car for the pace lap to start the 63rd Little 500. The green flag drops and the Betas take the lead. 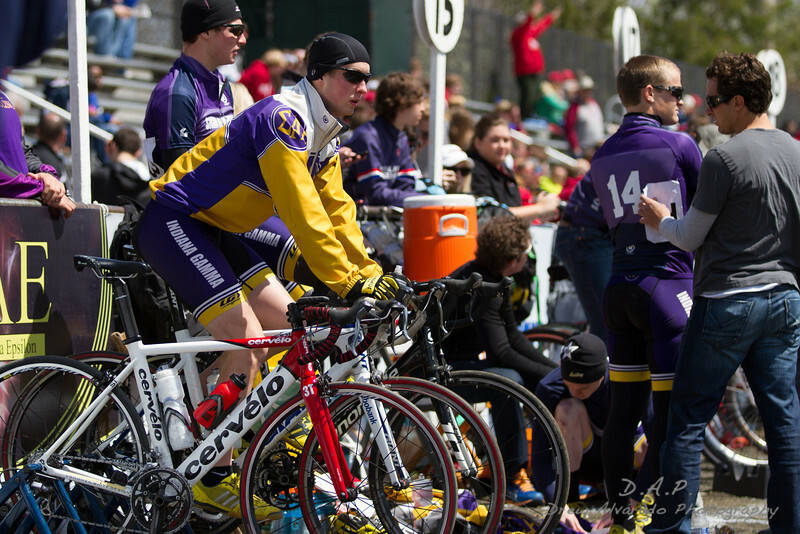 Phi Gamma Delta rider prepares for their first of many rider changes throughout the course of the next 200 laps. 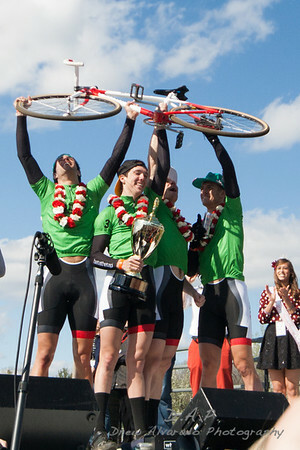 The Cutters, while in contention through most of the race, were only able to pull out a fourth place finish. 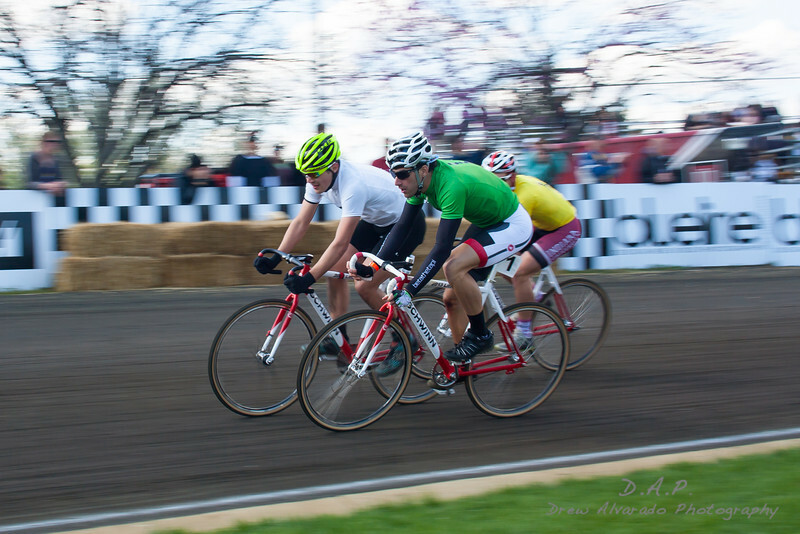 The cutters are the winningest team in the history of the little 500. 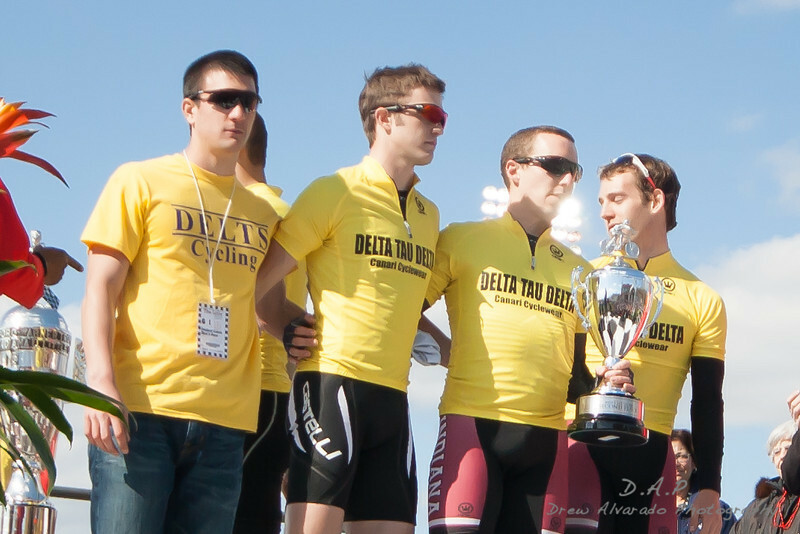 With 12 wins the the Cutter enjoyed a winning streak from 2007-2011 which was brought to an end last year by Delta Tau Delta. 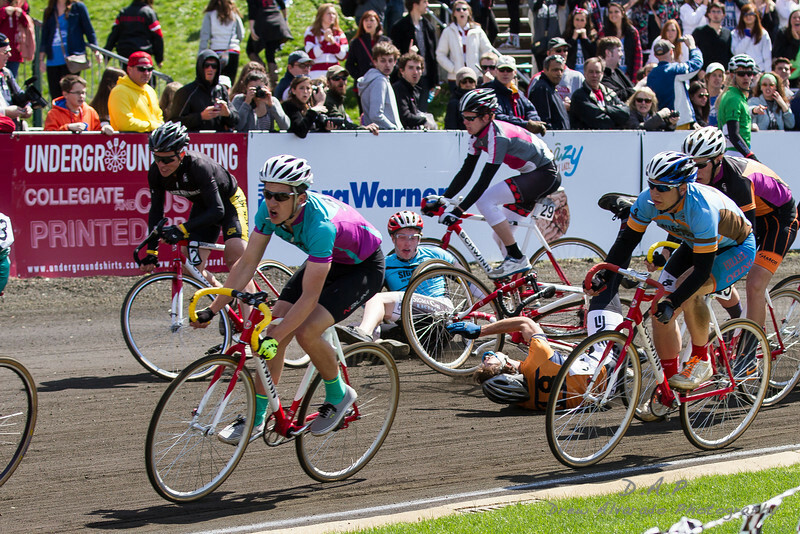 Turn one and three are commonplaces for crashes to occur. With racers reentering the track after making rider exchanges or competitors trying to make position changes these two turns can see a lot of action. 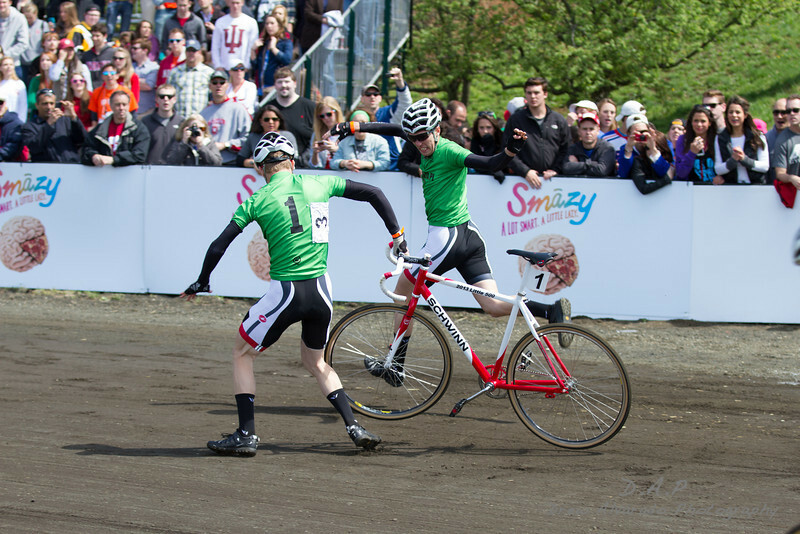 More crashes and confusion as the rider changes interferes with the tail end of the lead pack. 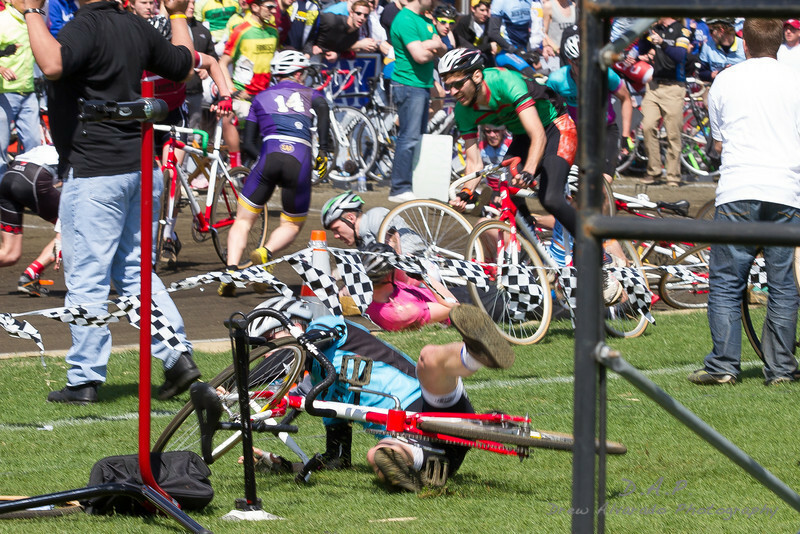 With crashed bikes comes the need for a good team bike mechanic. 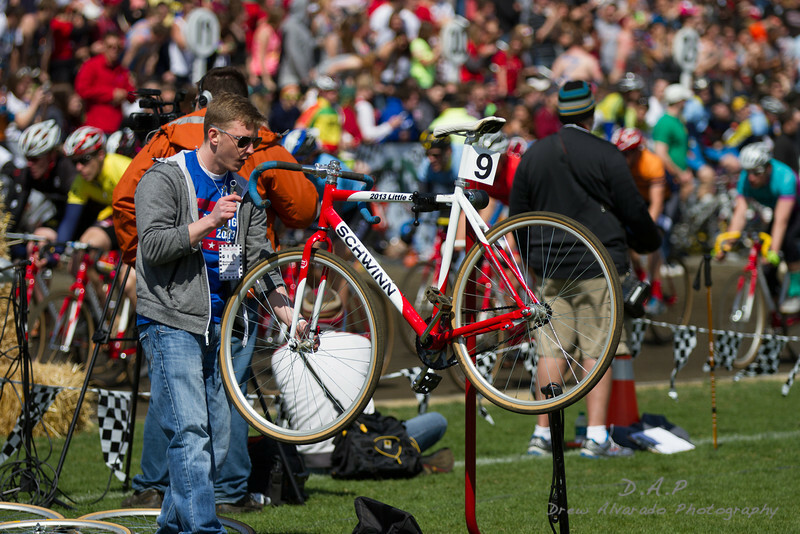 Here the Air Force team mechanic makes sure that the back up bike is ready for action. 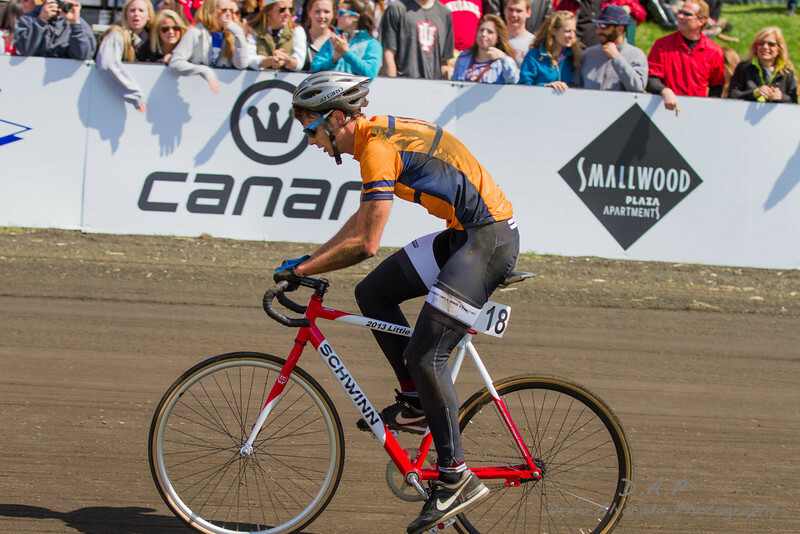 For some teams they will need more than a good bike mechanic to get them back on the track. Battered and bruised. 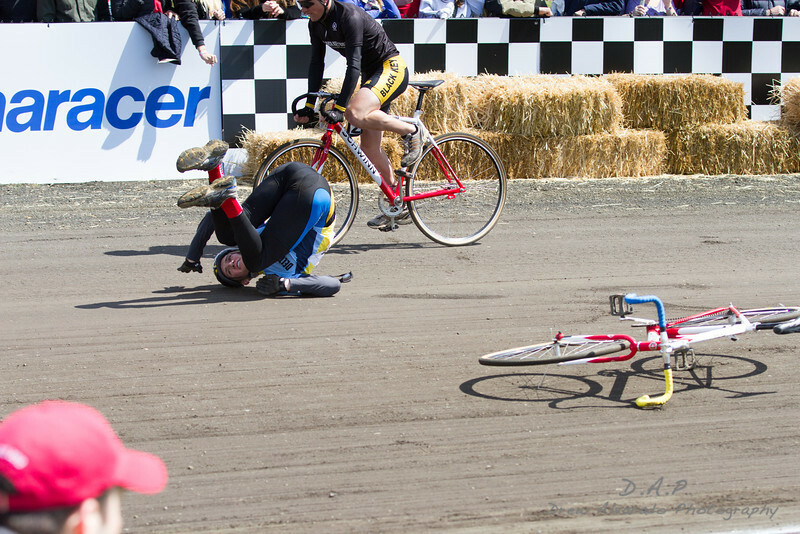 After nearly 200 laps the race can start to take it’s toll on some riders. 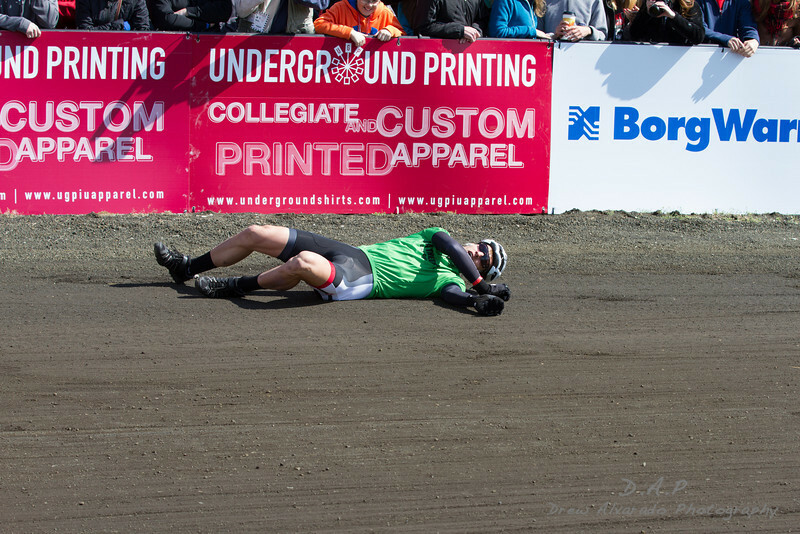 Here this Gray Goat team rider shows his battle scars from crashing on a cinder track. 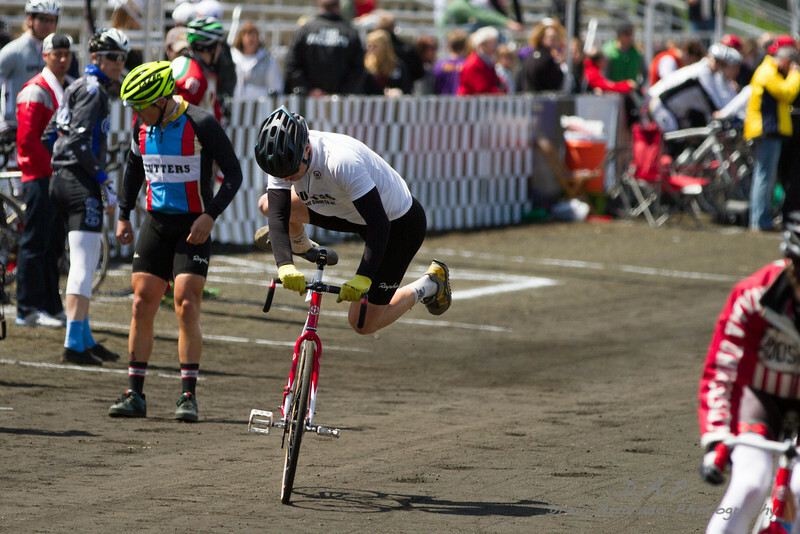 A clean, and fast rider exchange can mean the difference between gaining ground with a fresh rider, or loosing ground an a chance for a win. 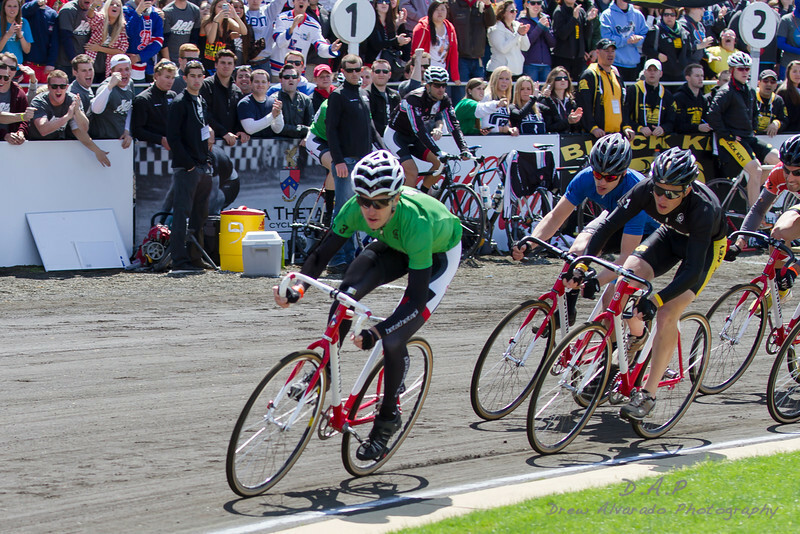 A final series of burnouts and rider changes puts Team Beta Theta Pi back in front to fight for a win. For some the Thill Of Victory. For others it is the agony of defeat. Third place finishers Phi Delta Theta. Second place went to Delt Tau Delta. 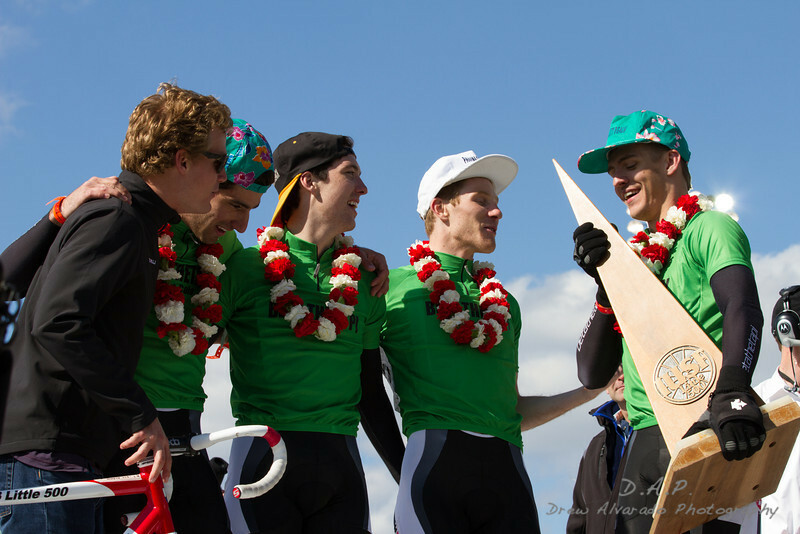 Pole sitters Beta Theta Pi win the 63rd littila 500 with a 0.319 second lead. The Betas take their victory lap. This is a big day for the Betas as this is their first win since 1964.